I think I may have a new faveorite Ben & Jerry's chunk! Yes, I will say it loud and proud: I am a chunk spurlunker! Up until now my long standing favorite chunk has been the cookies in the Mint Chocolate cookie. 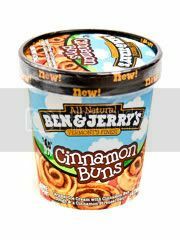 But I have fallen in love with the little teeny "buns" of cinnamon bun dough in this pint. The base ice cream is caramel. I honestly didn't notice a very strong caramel flavor to it but it is pleasently sweet and of course it is rich and has that terrific mouth feel that you get with top of the line ice cream. There is a cinnamon swirl running though. The swirl is subtle, at first I thought that because it's so light that it may cause the ice cream to be bland. But no! once I got to the first "bun" firey cinnamon, grainy dough, slightly sweet OMG it was perfect! If you love cinnamon rolls then this is the ice cream you have been waiting for. And if you just want something different also a great choice. Hey Jim- do you guys have this flavor in the UK? GI We certainly don't but im salivating at the thought!! I love cinnamon buns sooo much!! I used to love hitting them up slightly them eating them with vanilla ice cream!! I'm no longer working at Unilever anymore! I finished my placement there and im back studying at university with too much time on my hands :( shame! I could have tried to get some imported!! DOH!